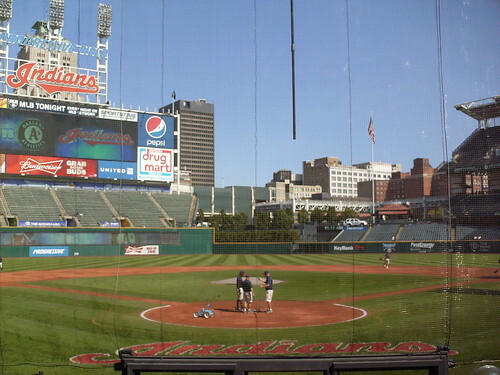 The view from behind home plate at Progressive Field, looking out to downtown Cleveland. 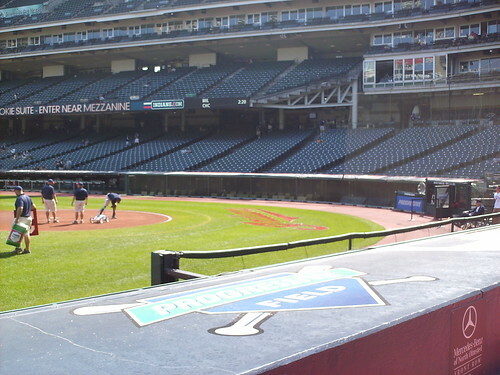 The view from down the third base line, looking toward the outfield grandstand. 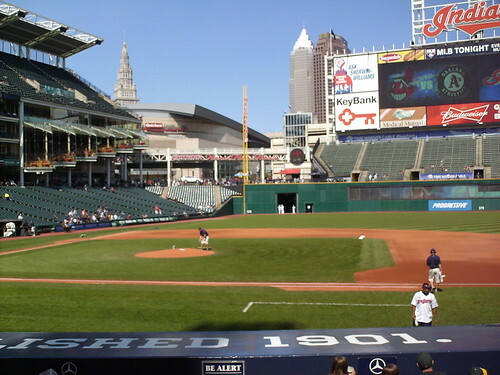 The view from the first base stands. 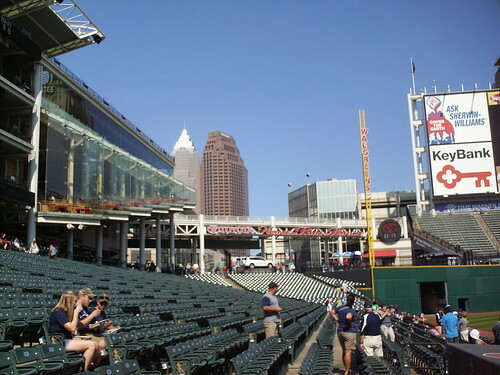 The Quicken Loans Arena sits right next to the ballpark. 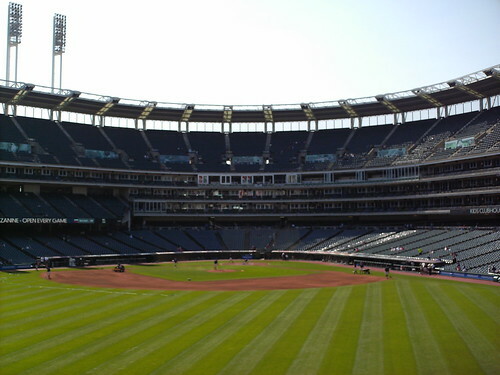 The grandstand at Progressive Field as seen from center field. 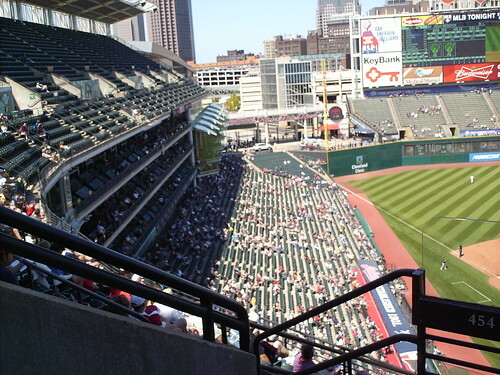 The main seating bowl and upper deck are separated by three levels of luxury boxes. 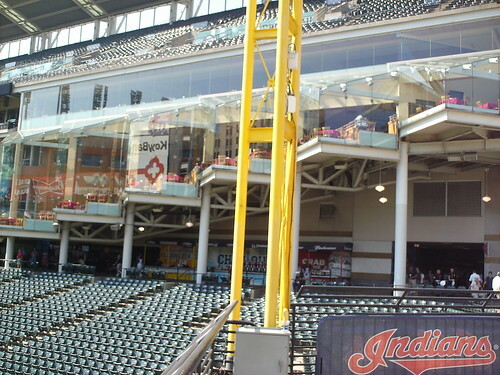 Dugout suites ring the backstop, giving some fans a closeup view of the field. 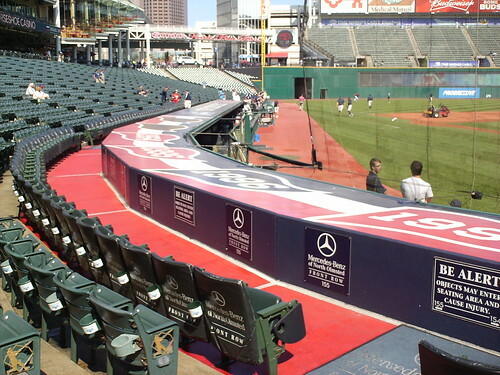 Fans in the first row are treated to cushioned chairs, extra leg room, and the red carpet treatment. 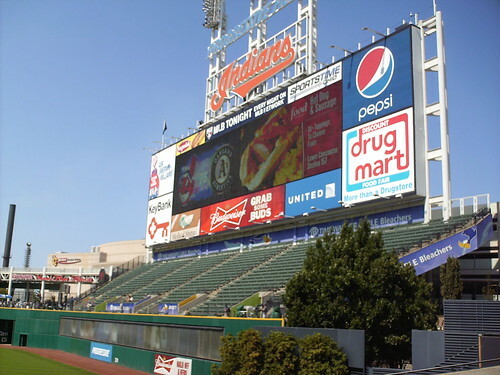 The bleachers and large video scoreboard sit atop the tall right field wall. 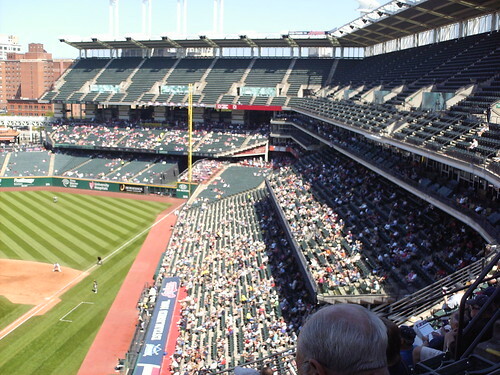 The stands on the first base side feature three rows of luxury boxes and a wide main seating area. 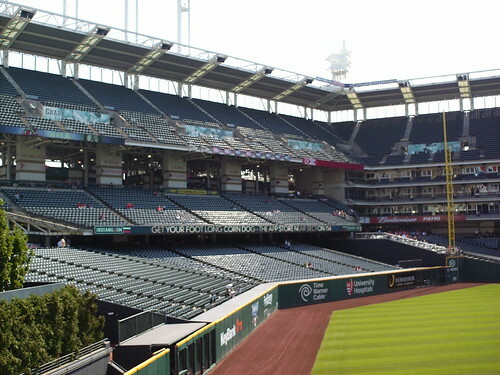 The third base side, however, features a second deck that looks like it was pulled out of the luxury box area like a drawer. 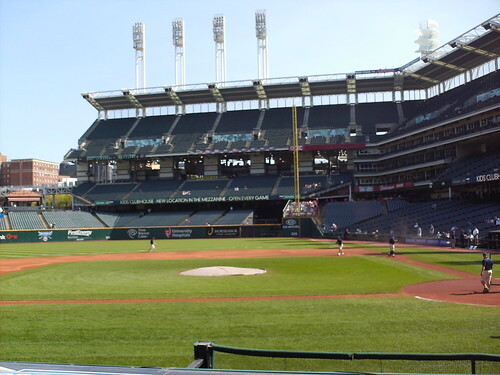 The bleachers overlook the outfield, and are home to the famed large native drum that beats when the Indians are rallying. 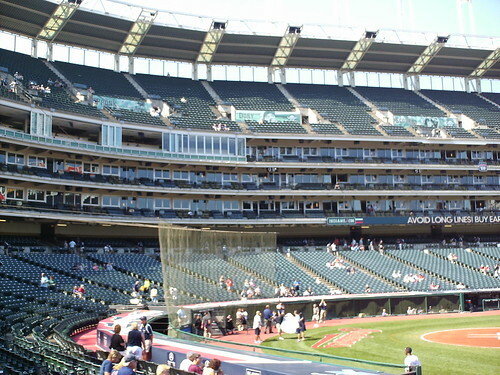 The home run terrace in the left field corner features an open concourse looking out to downtown, and a bridge overlooking the field. 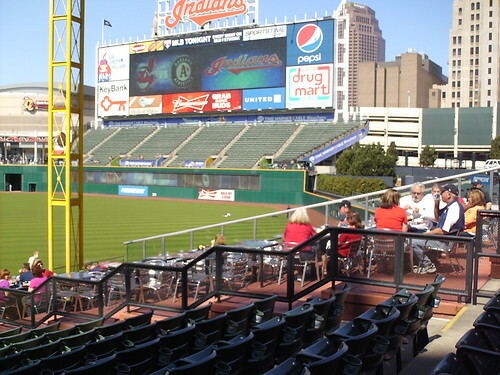 A restaurant in the left field corner features staggered window seating angled out and back toward home plate. 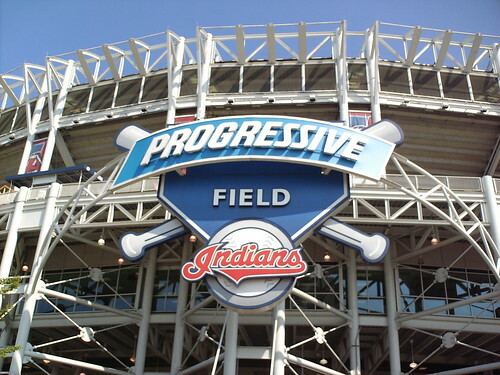 The poles holding up the upper deck in the outfield feature the Indian's retired numbers. 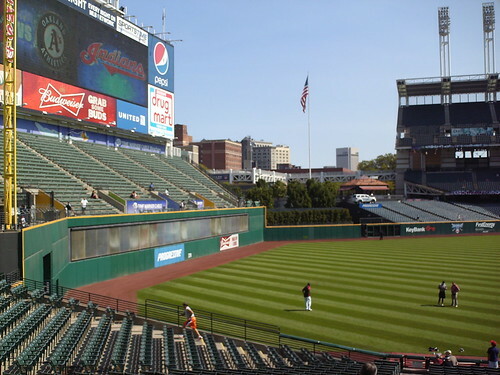 The Budweiser picnic area offers group seating in the right field corner. 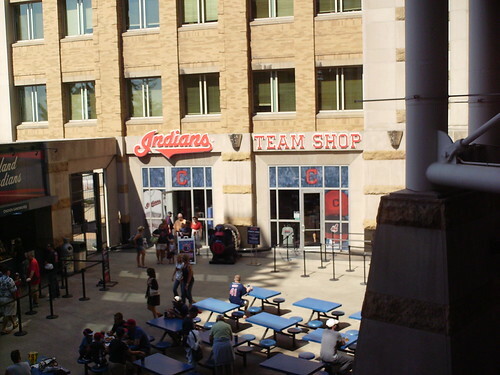 The Indians team store is housed in the warehouse style building along the concourse. 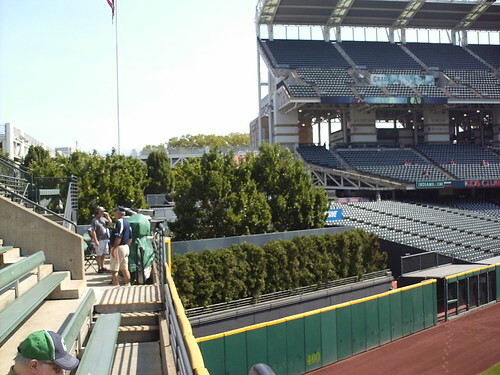 The batter's eye is a couple of groves of trees in center field. 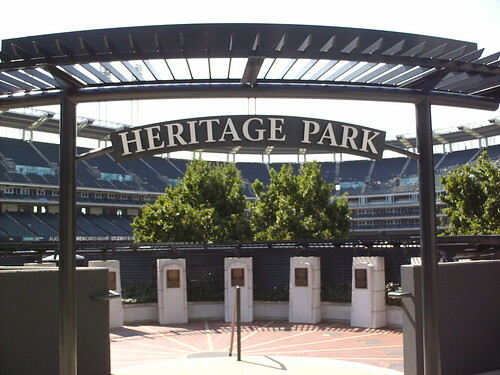 Heritage Park behind the batter's eye in center field honors Indians Hall of Famers. 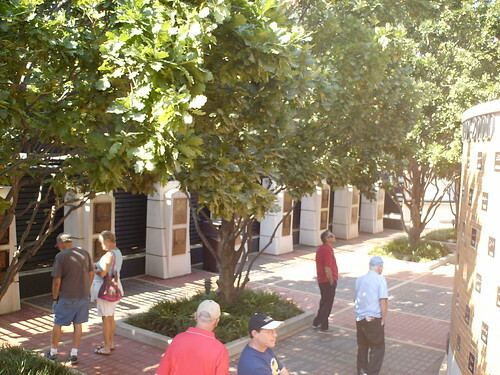 The landscaped area features monuments to Hall of Fame players, and the wall on the left honors the top 100 players of the franchise's first 100 years. 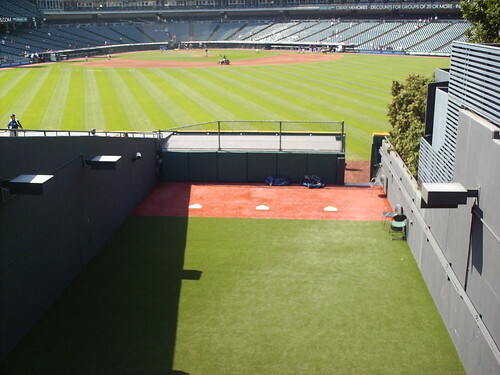 The bullpens face in toward the field, rather than paralleling it like in most parks. 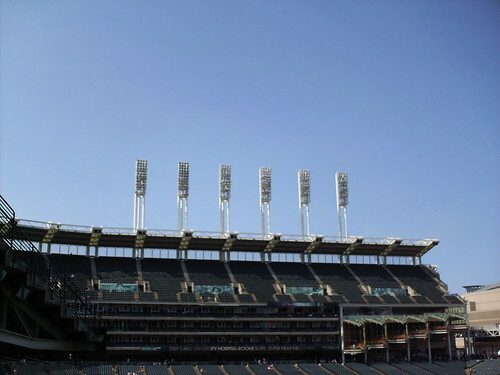 The "toothbrush" style light standards have become a defining feature of the ballpark. 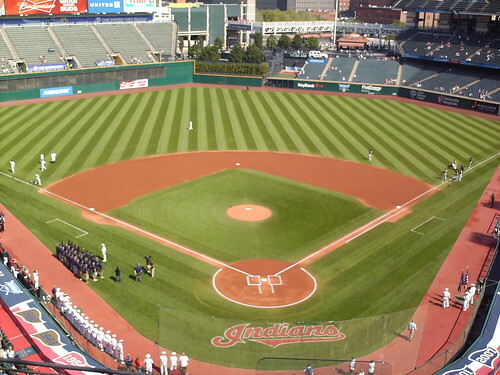 The view of the playing field from the upper deck before a game. 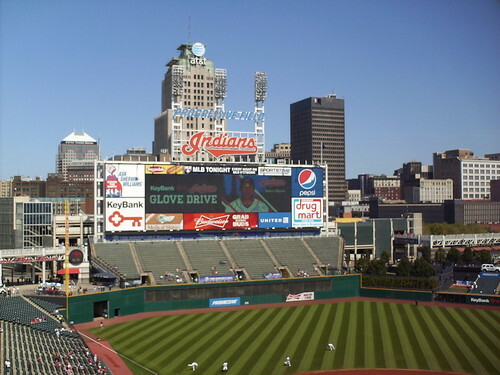 When it was built in the early 1990's, the then Jacobs Field helped set the standard for the modern downtown "retro" style ballpark with many variances in the outfield depth and height, including the "mini monster" in left field. 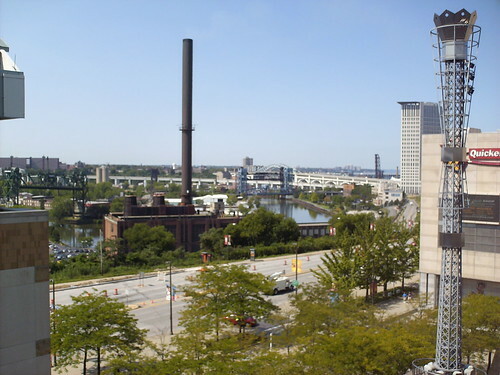 The Cuyahoga River, and the bridges that inspire the Progressive Field architecture, as seen from inside the park. The Blue Angels write the Indian's script "I" in the sky during an in-game flyover. 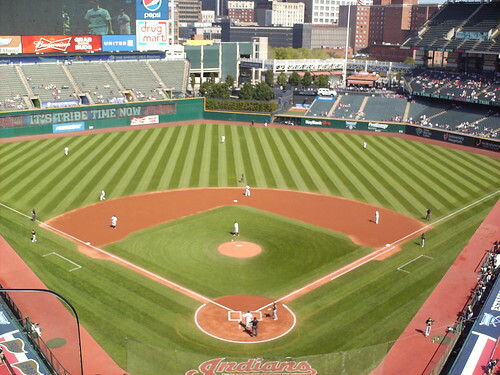 The Cleveland Indians on the field during a game at Progressive Field.